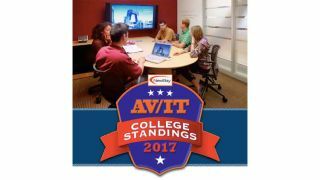 The first ever AV/IT Rankings program: the deadline for universities and university departments, AV integrators, AV designers, architects, and AV, Digital Signage, and AV/IT solution providers to enter their projects is March 15. The entry portal can be accessed by clicking here. With the launch of the new AV/IT Standings program from NewBay Media–I have never been more excited about a project, this new service to the higher education community and those who serve it. We’re used to seeing rankings of colleges according to their status in providing the “best” education for students, in broad terms, in value terms, with generic criteria. And we’ve seen evaluation of “technology schools” like engineering or computer science schools–with the focus on the quality or value of the tech degree conferred by those institutions. But why has there not been a closer look at, or ranking of, how a college or university uses technology in any school, department, discipline, or application to help students, staff, or faculty have a richer learning/teaching experience? Now there is. The program, portal, and publications will offer a close look at how colleges and universities use technology in any school, department, discipline, or application to help students, staff, or faculty have a richer learning/teaching experience. And we’ll be ranking by the sophistication and usefulness to students, faculty, and staff of the collaboration, video, learning management, digital signage, or teaching technology. Because improving learning outcomes is the new mission of higher education. To position students for success in a workplace of the future, learning spaces are being designed to support peer-to-peer, collaborative, experiential, visual, service-oriented, and value-based pedagogies. As exciting as that is, the mission now increasingly includes new approaches to campus life on a fuller scale–with new and different needs for security, achieving diversity goals, sports and recreational activities, and community and alumni participation. This publication kicks off the program– including the guidelines for the new online form for folks to submit their university projects. And in the AV/IT Rankings publication April 2017, we will present our “rankings”: we’ll be ranking college and university applications by how sophisticated and useful to students, faculty, and staff their technology systems are. Note, this is not an “Awards” program, it’s a service to the community. In addition to the rankings whose goal it is to call out great new spaces and new applications in schools that can serve as an inspiration to all, we will have case study and thought leadership articles from high level college administrators, from top integrators and design consultants, from top technology experts, and even from advanced students. For all the details, and to enter the rankings, click here.